Over the past several months I have been part of a group in the Las Vegas area that holds a meeting on every second Friday of the month to write letters to political prisoners who are currently being held in U.S. prisons. We meet at the Rainbow’s End Cafe, which is located at 1100 E. Sahara, just west of Maryland Parkway, from 6pm to 8pm. It’s also the same location where we hold the Las Vegas Anarchist Cafe every Saturday, again from 6pm to 8pm. The individuals picked to write to are typically chosen based on their birth date, with a card being sent to whoever is having (or has had) a birthday that month. It’s not generally based on popularity or name recognition, although we did send a card to Leonard Peltier this month (September). One of the previous recipients of a card was Janet Africa, a member of the MOVE organization. In case you’re not familiar with MOVE, they were a Philadelphia Anarchist group that was violently attacked twice in the 1980’s by the Philadelphia police. The police used some nuisance complaints from their neighbors to justify these attacks and the brutality and killings that went along with them. The reality is that they were merely a convenient excuse to attack MOVE for their political beliefs and agitation against the government. In the second and final attack, the police actually blew up the entire neighborhood surrounding the building in which they lived. All told by the end of the assault on MOVE, 61 houses had been destroyed and 11 members of MOVE, including children and John Africa, the leader of MOVE, were killed. Janet Africa and nine other members of MOVE were charged with and eventually convicted of murdering a cop, who was actually shot by another cop. As of 2015, they have been held as prisoners for 37 years, in spite of the fact that it is fairly common knowledge that none of them actually committed crime for which they were convicted and sentenced. You can read more about the incident in which MOVE’s home and the surrounding neighborhood were intentionally destroyed in a post Pete Eyre wrote on Cop Block several years ago entitled “Philadelphia: The City That Bombed Itself.” There’s also a rather good documentary about MOVE and the police attacks on them called “Let the Fire Burn,” which can be viewed online. How are you I received the card. Be sure and tell everyone there, we appreciate the support and concern. We are doing good and staying strong on this end despite this Gov’t keeping us in prison for 37 years. They know we are innocent. Our example has crystallized how this system is not geared to what is right. They do whatever they feel is advantageous for them. They think by telling lies about MOVE trying to convince people that we are guilty and belong in prison will get them want they want but it will not. People are not just sitting by accepting injustice. They are fighting for our release. This is the wisdom taught to us by JOHN AFRICA. I’m going to close this one for now. Stay strong, I am doing the same. It was very nice and (for me) unexpected to receive return mail from someone we had been writing to. 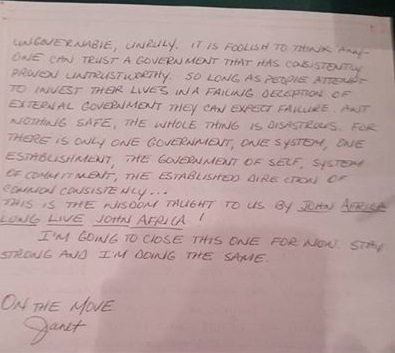 However, I’ve followed the MOVE incident for some time and the fact that one of the first political prisoners to write back to us was a member of that group was something that I appreciated very much, as well as the personal nature and insightful content of the letter itself. If you live in Las Vegas, you should join us next month. 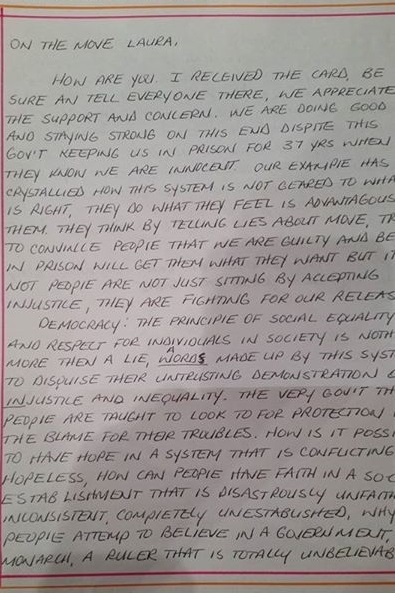 If you live elsewhere, I would very much encourage you to attend a political prisoner letter writing campaign in your own city, or start one if it doesn’t already exist. People imprisoned for political reasons need all the support and encouragement they can get from the outside world to continue the struggle. We should all make sure they know they are not alone in the fight.